An extraordinary piece of home decor, the Hammered Round Shield is designed in the fashion of a medieval targe. This shield features a pattern of dimples, giving it the appearance of being hammered into its rounded shape. Targes have were a popular choice of protection during this historical period in Europe, originating in Spain and eventually becoming widely used internationally for war and jousting. Exemplifying the qualities of a targe, this shield is circular in shape and around 20 inches in diameter. At the center of this shield, a metal shield boss is featured, greatly enhancing the authenticity of this design by creating a surface weapons will glance off of when properly blocked. Furthering this realistic design, this shield is crafted from iron. 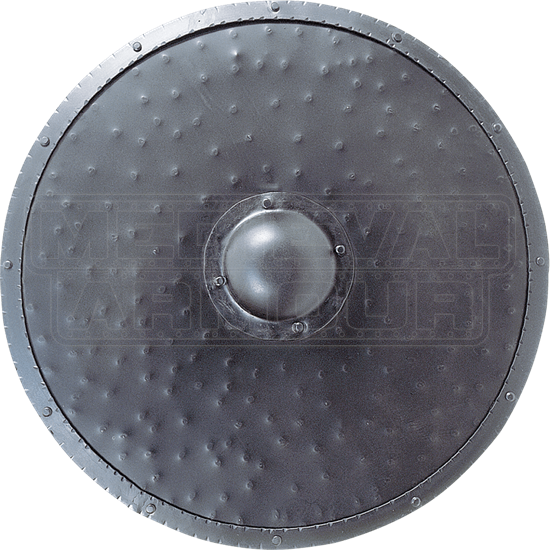 Demonstrate your fascination with medieval warfare by displaying the Hammered Round Shield.